Whether you have one or multiple buildings to protect - regardless of the number of users, iMotion Security provides flexible access solutions tailored to every customer’s different requirements: multi-site, multi-company, multi-station... Access control means checking that a person has the necessary clearance to enter an area, building or room. It helps organise human traffic inside a site and selectively manage access to different zones. In this way, sensitive areas can be restricted to identified users subject to predefined times, with all movements recorded in a log. iMotion’s systems integrate every identification technology from the market's major manufacturers (HID, Indala, etc…). Our technical expertise means we can analyse the badges you use today and recommend the solution best suited to your requirements. The badge’s serial number is recorded in the electronic chip in the badge. The antenna (or reader) determines the reading distance between it and the badge. From 30cm, it is called hands-free technology. 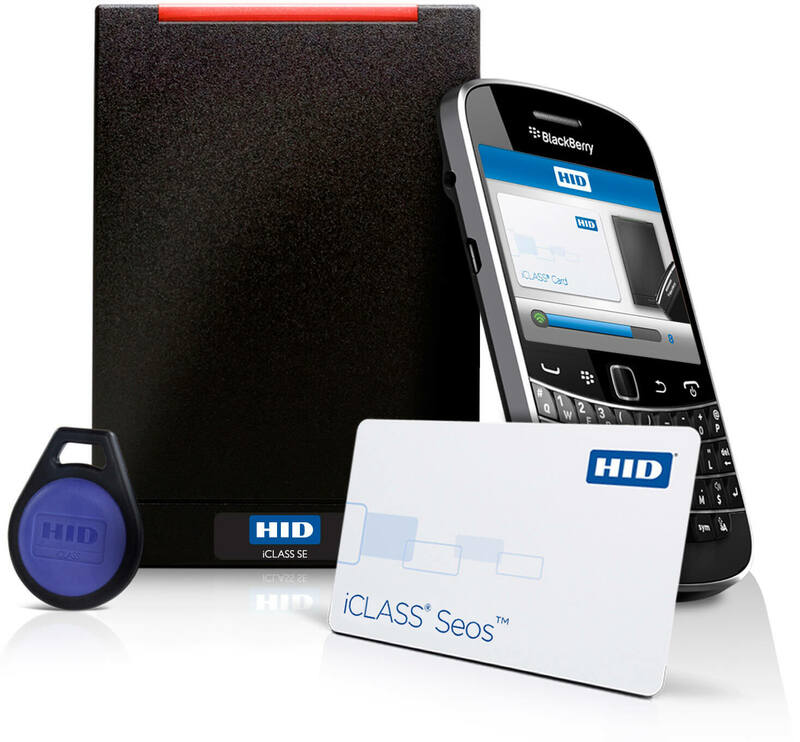 In the access control and identification industry, 125 kHz technology revolutionised the market by offering unrivalled value for money. Robust, without wear and tear and easy to set up, this technology has been a worldwide success and today represents the benchmark. With this frequency, the badge can be read at a distance of several metres, for example at a toll gate. The serial number in the badge’s chip is still being read, but the badge has a battery that is only activated when it is in the reader’s field, thus increasing the reading distance. It is called an active badge..
Our solution allows you to centralise your access management in one unique point with the possibility of allocating autonomous authorization to other sites. With our access control software, you can allocate nominative badges to users by defining the authorized areas and also allocate access times to these badges. Then you can manage visitor and staff traffic safely and securely. Using a password, the Access Control system consults the database to see the clearance of the identified person: validity start and end date, authorized areas, access times and dates, etc. According to this clearance, the system will authorize, or not, access to the area concerned and open the door, or not.. Create nominative badges and personalise them Allocate rights and clearance to these badges: who has access to which area and when? Archive every event in a log (access, alarm, etc.) for any later search or checks. Cross-reference, or search the logs for data according to specific criteria: date, time, access or not, etc. With its multi-profile management and flexible access allocation the iMotion solution adapts to your requirements and solves all your access management issues. Profile management requires creating a “badge holder” file in the software. This individual file will contain all the personal information pertaining to the badge holder. The badge holder’s individual file contains information about him or her: name, validity period, profile, etc. In the database, the administrator or the operator associates the badge holder to an identifier and allocates access clearance in the form of a profile. A profile is a group of geographical areas, times, dates, etc. For lift management, for example, the geographical area corresponds to a range of floors, i.e. : Mr Smith has clearance for areas A and D, Monday to Friday, between 9am and 6pm. Depending on the customer’s particularities, spare fields can store further information not necessarily associated with security such as clearance for specific training or access (electrical or other), for example: Mr Smith cannot access the electrical units because his clearance has expired. Ideal for managing sensitive areas and access to several buildings, the iMotion solution makes for easy clearance allocation, simplifying your profile management. A flexible tool, it meets every access management need, from the most straightforward to the most complicated. The software has an ISO format badge customisation module for creating card backgrounds with a photo, logo and text positioned wherever you like and also typeface colour, size and style. 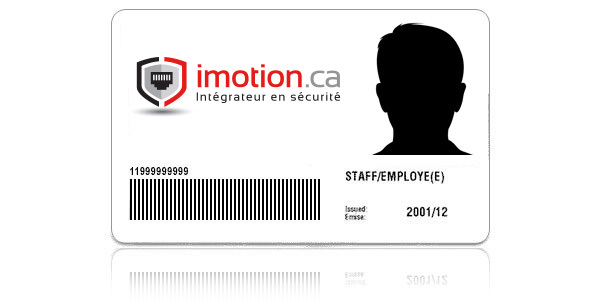 When entering a new badge holder in the iMotion system’s database, the operator chooses the card background to be used for printing. The module includes standard photo capture functions (Twain). 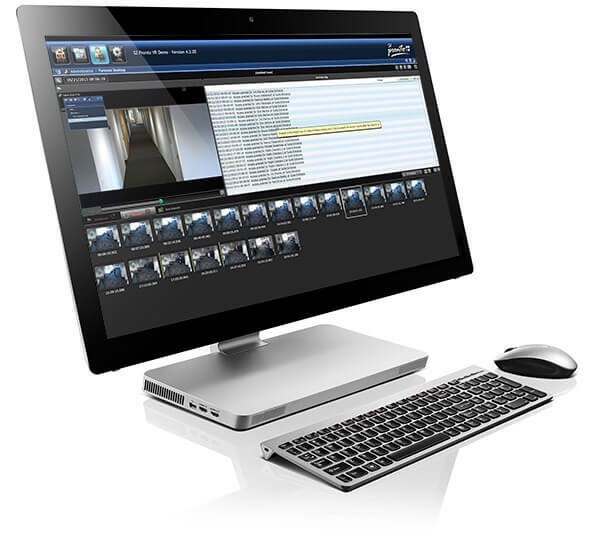 It is compatible with different technologies: video capture on webcams, digital cameras, file transfer by scanner, etc. The badge personalisation module uses very fast and simple photo cropping tools. It is compatible with most badge printers on the market. When creating a badge, coding enables the identification to be written directly in the badge. You have a large number of visitors to manage and would like to create badges quickly. The Visitor Management software saves time and cuts down on queues, being able to create a badge for someone outside the company who needs temporary access to the site. It requires the badges to be created as quickly as possible in order to be active immediately. It is therefore important that information about the visitor can be recorded prior to their visit. 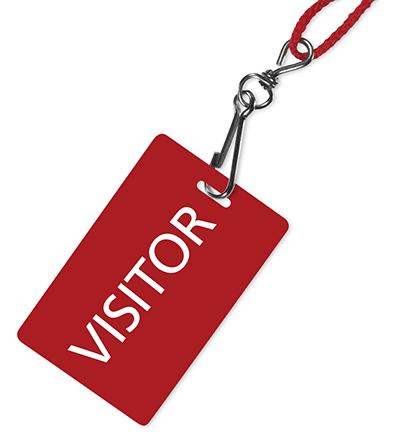 A visitor is by definition attached to a visited person. The receptionist can save time by finding all the information about the visited person in the badge holder’s database. Visitor information can be kept in the database (even though their badge has been deactivated); when they return to the site, the receptionist does not need to re-enter the information. The system’s automatic functions and the predefined profiles help accelerate the creation of visitor badges. The receptionist has a stock of visitor badges with numbers registered in the access system database; these badges have not been activated. When a visitor arrives at reception, he introduces himself to the receptionist who enters data about the visitor in the information file, allocating him one of the numbers of the inactive badges, and saves the information in the database. The receptionist can enter the number using the keyboard or by enrolment. Enrolment is when a table-top reader reads the identifier, avoiding any typing errors, and allocates it to a person. The system downloads the visitor profile and access clearance in the badge holders’ database, thus activating the badge. When the visitor leaves, he hands in his badge to reception and the receptionist deactivates it, cancelling the badge’s access clearance. The badge is now inactive and available for any other use. This operation can also be carried out automatically using a motorized reader. The history of visitor movements is stored in the visitor log to be checked at a later date if necessary; it contains all the information about who had clearance and when.